Bill Maher responds to right wingers who are attacking Michelle Obama’s Let’s Move program as part of their attitude of attacking everything. Sarah Palin is trying to trademark her name. I imagine this is to prevent “Sarah Palin” from being used generically for all idiots the way Kleenex is used generically for all facial tissue. For now her application to trademark her name and Bristol’s name was rejected because the forms were submitted unsigned. She must have washed that portion of her hand. We had been detained by Egyptian authorities, handed over to the country’s dreaded Mukhabarat, the secret police, and interrogated. They left us all night in a cold room, on hard orange plastic stools, under fluorescent lights. We — Souad Mekhennet, Nicholas Kulish and a driver, who is not a journalist and was not involved in the demonstrations — were detained Thursday afternoon while driving into Cairo. We were stopped at a checkpoint and thus began a 24-hour journey through Egyptian detention, ending with — we were told by the soldiers who delivered us there — the secret police. When asked, they declined to identify themselves. According to the Committee to Protect Journalists, over the period we were held there were 30 detentions of journalists, 26 assaults and 8 instances of equipment being seized. We saw a journalist with his head bandaged and others brought in with jackets thrown over their heads as they were led by armed men. Over the last few years I’ve pointed out several times that Barry Goldwater, with his support for individual liberty and opposition to the religious right, would not get along with today’s conservative movement. The right wing is moving so far right so quickly that the Tea Party supporters would see Ronald Reagan as a socialist if they actually had any knowledge about his policies. Certainly, Reagan’s boldest move as president was his 1981 tax cut, a sweeping measure that slashed the marginal rate on the wealthiest Americans from 70 percent to 50 percent. The legislation also included smaller cuts in lower tax brackets, as well as big breaks for corporations and the oil industry. But the following year, as the economy was mired in recession and the federal deficit was spiraling out of control, even groups such as the Business Roundtable lobbied Reagan to raise taxes. And he did: The Tax Equity and Fiscal Responsibility Act of 1982 was, at the time, the largest peacetime tax increase in U.S. history. Ultimately, Reagan signed measures that increased federal taxes every year of his two-term presidency except the first and the last. These included a higher gasoline levy, a 1986 tax reform deal that included the largest corporate tax increase in American history, and a substantial raise in payroll taxes in 1983 as part of a deal to keep Social Security solvent. While wealthy Americans benefitted from Reagan’s tax policies, blue-collar Americans paid a higher percentage of their income in taxes when Reagan left office than when he came in. Reagan was a serial tax raiser. As governor of California, Reagan “signed into law the largest tax increase in the history of any state up till then.” Meanwhile, state spending nearly doubled. As president, Reagan “raised taxes in seven of his eight years in office,” including four times in just two years. As former GOP Senator Alan Simpson, who called Reagan “a dear friend,” told NPR, “Ronald Reagan raised taxes 11 times in his administration — I was there.” “Reagan was never afraid to raise taxes,” said historian Douglas Brinkley, who edited Reagan’s memoir. Reagan the anti-tax zealot is “false mythology,” Brinkley said. Think Progress also pointed out how Reagan nearly tripled the deficit, how unemployment jumped over ten percent after his initial tax cut, and how income inequality exploded. Well, the Tea Party supports policies aimed at increasing income inequality further, but I’m not sure how many of them understand this. The right wing might also be unhappy about someone with Reagan’s actual record for reasons beyond his economic policies. He gave amnesty to three million undocumented aliens. On foreign policy, Reagan supported nuclear disarmament and negotiated arms reductions treaties with Soviet leader Mikhail Gorbachev. He generally opposed military retaliation for terrorist acts, even calling the death of innocent civilians in anti-terror operations “terrorism itself.” While his rhetoric supported the culture wars, Reagan, like other Republican leaders before Bush, generally avoided actual legislative support for their policies. Reagan even wound up helping to preserve Row v. Wade by appointing Sandra Day O’Connor to the Supreme Court. 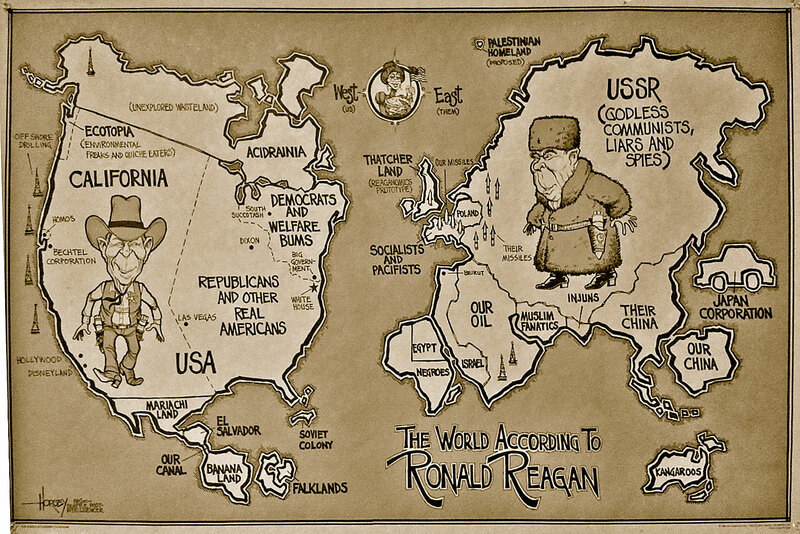 In preparation for the celebration of Ronald Reagan’s 100th Birthday, here is a map of the world in Ronald Reagan’s time (or at least his mind). Click on the image for a larger version. In follow up of yesterday’s story, The Note reports that John Kerry is not interested in being Secretary of State and is happy in his current position as Chairman of the Senate Foreign Relations Committee. Of course the position of Secretary of State is not currently available. We shall see what happens should the position open ut. Timing might also be important as he’d have to have the position for a meaningful amount of time for it to be worth giving up his Senate seat and current Chairmanship. « Would Republicans Consider It Unconstitutional For Federal Government To Destroy Asteroids Headed For The Earth?